Choosing the right fencing materials from A to Z Quality Fencing & Structures is the first step to building your ideal fence. If you are not sure which fencing materials will work best for you, our expert installers can help. To learn about our custom fencing materials, including everything from wood, vinyl /PVC, to wrought iron/steel, aluminum, or chain link, click on the different fencing materials below. Know what fencing materials you want for your custom fence? 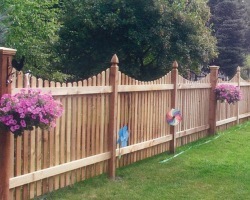 Go to our fence styles page next to see the different style choices! 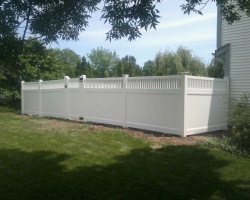 Or get a free quote on your custom fence now! Don’t see what you are looking for? Contact us to discuss your custom fencing needs! Wooden fencing’s natural appearance and versatility make it the best choice for many fence projects. 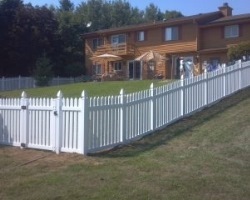 Wooden fencing offers many different custom design and style options included the ability to create curved lines. In addition, wooden fencing may be stained or painted giving it the final touch to complete a custom fence project! A to Z Quality Fencing offers three types of wooden fencing construction: Northern White Cedar, Western Red Cedar, and treated lumber. 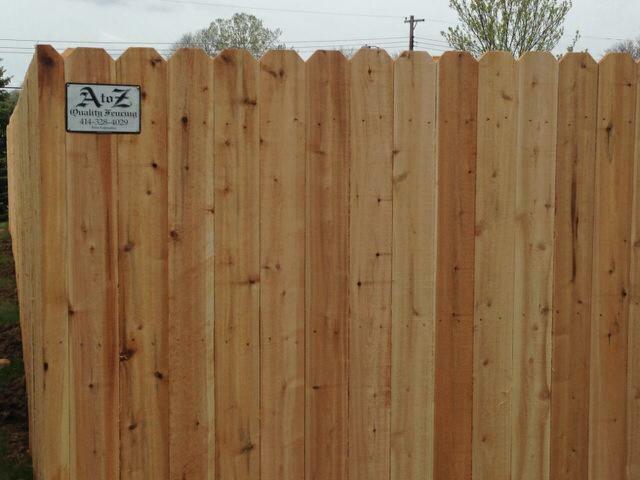 A to Z Quality Fencing’s goal is to build a beautiful wood fence that will last! Therefore the majority of A to Z’s fences are constructed using Northern White Cedar because of lumber quality. Northern White Cedar boards are thicker and more durable. A to Z uses Northern White Cedar 5″ x 5″ gate posts cemented 4 feet deep versus the industry standard of 4″ x 4″ gate posts cemented 3 feet deep. Our special bilateral alignment process guarantees level posts and straight lines! In addition, A to Z Quality Fencing offers the best built gates and the best gate guarantee in the industry – 7 full years. The cost of a high quality wooden fencing from A to Z Quality Fencing ranges between $21 – $31 per linear foot. Increasing lumber costs do drive up the cost of manufactured wood fence products. Please request a free quote for your project to get the most accurate pricing available. Wooden fencing requires ongoing upkeep and maintenance to preserve it from the elements and pests as well as maintain its beauty for years to comes. 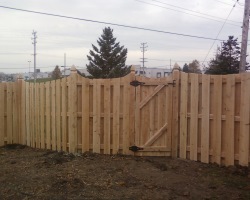 Is a custom cedar fence for you? Figure out the fence style you want next or get a free quote! Vinyl fencing — also known as PVC fencing — is manufactured from polyvinyl chloride (PVC), a thermoplastic resin that’s combined with micro-ingredients to give vinyl fencing its distinctive color, texture, impact resistance, flexibility and durability. Vinyl fencing is available in white, light tan and dark tan colors and adaptable to many architectural styles. Vinyl fencing is initially more expensive than wood fencing, ranging from $25 – $45 per linear foot, but vinyl fence is an excellent, low-maintenance alternative. 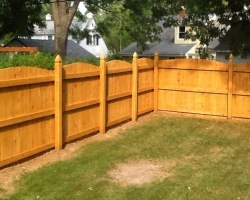 We are Southeastern Wisconsin’s premier source for vinyl fencing (PVC). We manufacture our own vinyl fencing through American Manufactured Vinyl Fence (AMVF), a division of A to Z Quality Fencing, LLC. Our vinyl is one of the highest quality vinyl fences available minimizing the impact of UV light and extreme temperatures. All materials are 100% American made. Virtually maintenance free – vinyl won’t warp, rot, splinter, peel or blister like wood, and it never needs sanding, staining or painting. All it needs is an occasional washing with a garden hose to keep it looking its best. Wide variety of styles, colors and textures including an authentic wood grain textures and stucco walls! Consistent color and fade protection. Concealed fasteners for a sleek, clean finish. Routed rails and fence posts provide a secure connection allowing for thermal expansion season after season. Galvanized frame in all gates to prevent sagging especially in wide gated areas. 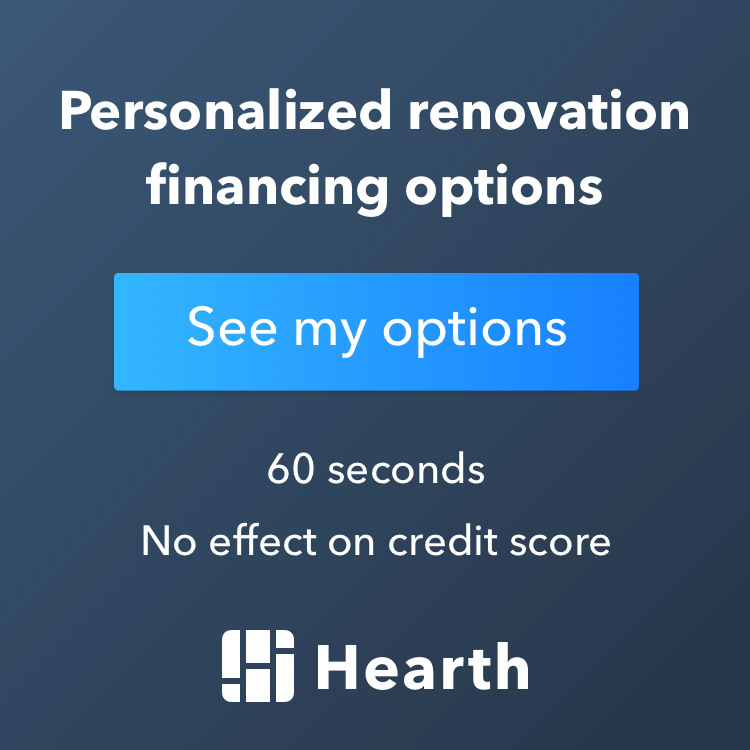 Lifetime limited warranty protection which covers warranted repair and replacement costs – including labor – for seven years after installation. See more pictures and learn more about the available vinyl fencing styles and options or get a free quote. Aluminum fencing is a maintenance free lightweight product with the look of wrought iron. Aluminum fencing provides many options for high quality, affordable ornamental iron fencing because aluminum is strong, long lasting, rust proof, visually diverse, and widely available. If you are looking for straight lines and modern architecture, aluminum fencing is an ideal choice. Some aluminum fencing is more durable than steel but not as stiff. Limited lifetime warranty including labor for 7 years after installation. Aluminum fence costs $31 – $60 per linear foot depending on features selected. In addition to fencing, gate and railing only options are available to be combined with other architectural materials of your choice. 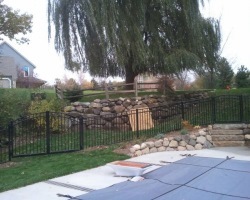 Get a free quote on your custom aluminum fencing now! A wrought iron fence is typically used in traditional homes such as Colonial or Victorian. Original wrought iron is welded in a labor intensive casting process. It is difficult to produce because forms have to be precise to reduce chances of a wave or a bulge in the fence. Today, a wrought iron fence is made of modern steel instead of cast iron because of the cost and longevity of the fence materials. A wrought iron fence made from this material lasts longer (traditional iron rusts quickly if scratched), is less expensive, similar in strength, more flexible, and offers the same options as old-fashioned cast wrought iron fencing. Modern wrought iron fence material provides strength and durability however it requires painting and does fade. It is more restrictive in its possible uses than other modern fencing materials because of its weight and strength. Residential grade steel at 6′ height runs approximately $60per linear foot. Residential grade steel at 3′ height runs approximately $30 per linear foot. Today’s wrought iron fence is more costly than other modern fencing materials. Often aluminum can be used to accomplish the look of a wrought iron fence at a much lower cost than a steel fence. Get a free quote on your custom wrought iron fence! A to Z Quality Fencing installs chain link fencing for a strong, long-lasting and most economical fence option. Chain link fencing is best used in gardens, sport courts, dog areas, or any area needing a temporary fence or boundary fence. Mesh or slats may be added for privacy. Make sure to check any association rules in your location, many subdivisions do not allow chain link fencing. Galvanized or vinyl coated chain link options are available. The thicker the galvanization means a stronger fence overall which is more resistant to rust and corrosion. Vinyl coated chain link fencing is available in black, green or brown. All chain link fencing comes with a 15 year manufacturer and labor warranty. All posts are driven in the ground 48″ to avoid frost heave. We offer your choice of residential tube, ss20 and ss40 for all frame work. Chain link fencing costs approximately $12 -$18 per linear foot. 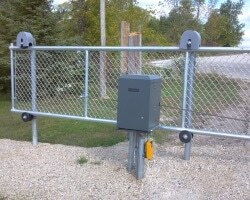 Get a quote on your custom chain link fencing! 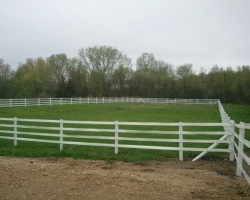 Horse fencing materials are different from residential and commercial fencing materials. Horse fence materials include High Tensile Polymer (HTP), vinyl, wood (oak board or treated), or aluminum post & rail. Read more about these materials on our page dedicated to horse fencing materials! 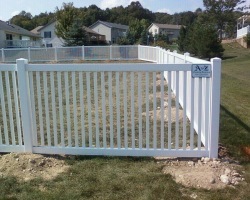 We have all of your fencing solutions! Contact us for information about removable pool enclosures and pool fencing ideas, tennis court fencing, and baseball diamond fencing including backstops and batting cages. If you don’t see your fencing needs listed here, please contact us.